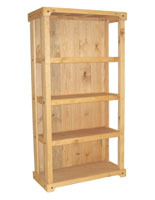 Ever wondered where to buy rustic wood retail store display fixtures? 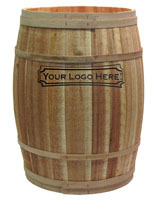 These wooden accessories have a unique style that brings a vintage feel to any shop, trade show booth, or commercial business environment. 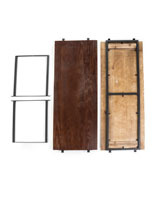 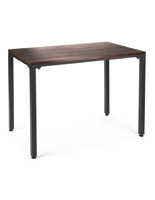 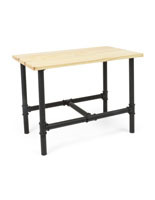 StoreFixture.com’s new, wholesale price rustic wood retail store display fixtures come in a variety of styles with stained or natural finish to complement any use or decor style. 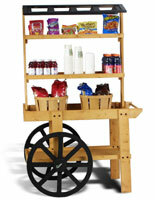 These real wooden accessories add to a welcoming atmosphere that encourages customers to browse, while offering high visibility and easy access to bulk, impulse, sale, or specialty merchandise. 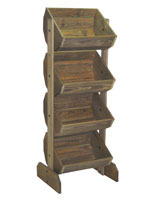 Once found only in traditional country or general store environments, rustic wood retail store display fixtures, also known as reclaimed-look merchandising fixtures, make a great addition to any commercial location. 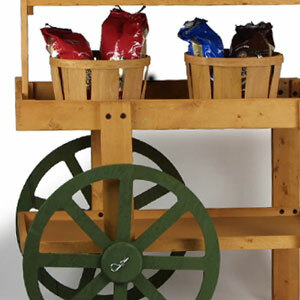 Different sizes and shapes — such as barrels, A-frame shelving, stacking crates, wooden carts, nesting tables, or open bins — can accommodate and emphasize artisan products, bulk impulse merchandise, seasonal items, soft goods, product samples, and more, while adding a vintage feel to contemporary businesses, shops, and trade show booths. 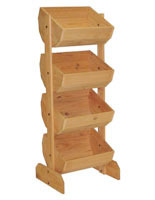 What types of specialty wooden merchandising and decor accessories are available? 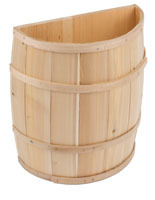 Baskets are one of the most recognizable rustic wood retail store display fixtures. 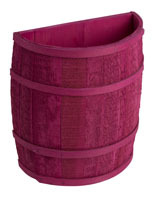 Made of woven wicker or wooden slats, these bulk fixtures come in square, rectangular, and traditional round shapes to accommodate any merchandising need. 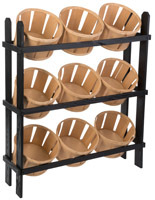 Offering bulk storage and easy access for customers, baskets make great dump bins for seasonal merchandise or impulse items as well as everyday products and can be used singly or as part of larger shelving units. 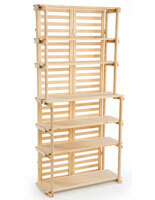 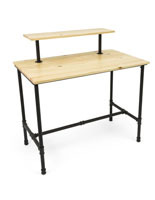 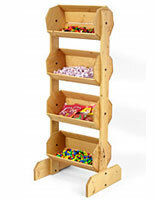 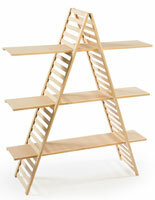 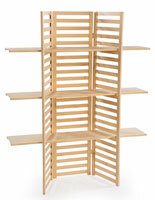 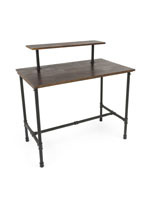 Freestanding reclaimed-look merchandising stands help keep inventory organized while offering high visibility. 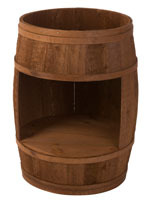 These floor standing vintage accessories feature fixed or removable bins designed to allow shoppers easy access. 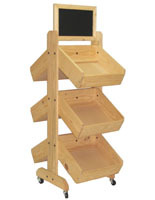 Sturdy country-style wood retail store display fixtures are a great choice for showcasing soft goods, accessories, bulk merchandise, and even artisanal goods and food products. 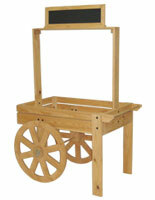 Many styles incorporate traditional chalkboard signage for pricing and identification. 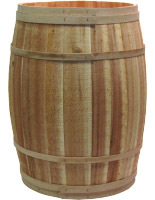 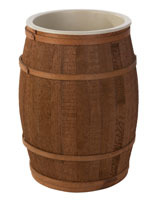 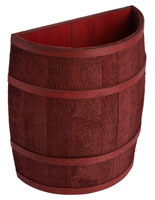 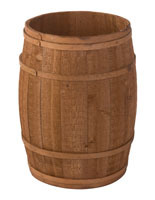 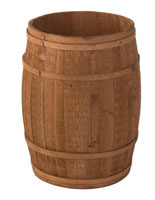 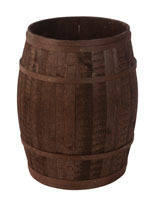 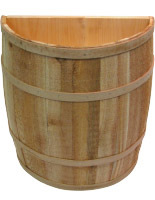 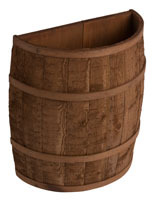 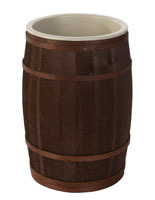 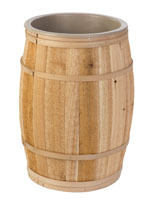 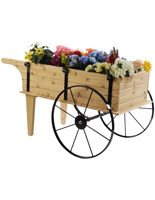 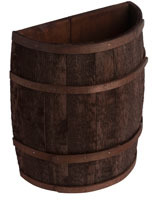 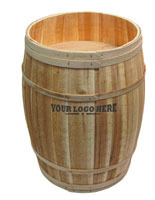 Traditional wooden barrels make eye-catching additions to any commercial business or shop. 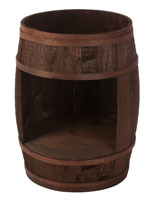 Available in full and half cask styles, these versatile merchandising stands come in natural finishes as well as bold stain colors to complement any decor. 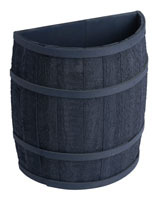 False bottoms and open-front cutout barrel styles keep merchandise within easy reach of customers, while lids and food-safe liners protect perishable items. 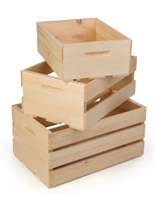 Natural wooden crates can coordinate with or complement any decor. 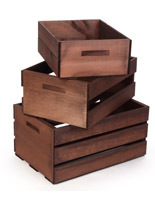 Nested design allows these old-fashioned countertop stackable cube units to be used in almost any configuration to best complement merchandising needs. 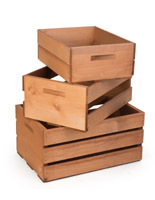 In addition to attracting customer attention in retail stores, stained or natural wooden crates make great specialty display fixtures in boutiques, grocery markets, commercial businesses, and bakeries or restaurants. 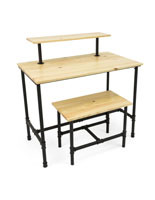 Country-style shelving display fixtures, such as our elegant A-frame or traditional box shelves, bring a touch of natural ambience into salons, stores, galleries, restaurants, and more. 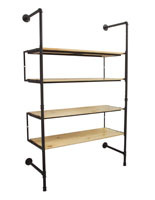 These full-size freestanding shelf units offer elegant merchandise storage solutions while creating high visibility feature elements designed to encourage customers to browse. 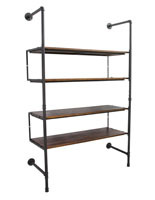 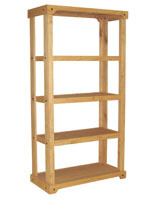 Simple folding shelves, sturdy floor fixtures, and elegant against-the-wall stands allow these versatile shelving units to be used in shop, professional business, hospitality, service, and trade show environments. 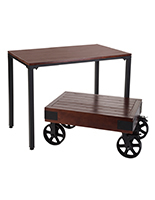 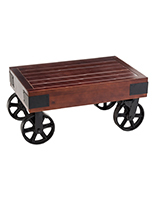 Vintage flower carts, nesting tables, and old-time vendor kiosk trolleys are a sure way to draw attention in commercial environments. 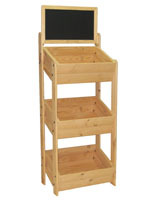 These simple, easy to move merchandising stands allow restaurants, specialty shops or departments, professional businesses, and organizations to quickly create high visibility focal points for merchandising, sampling, or advertising purposes. 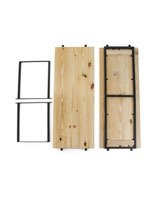 Wooden display fixtures for specialty merchandising are a great way for any operation to quickly create an eye-catching feature element. 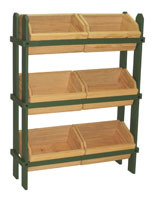 These versatile stands and containers are designed to attract attention in addition to providing bulk storage and organization for merchandise. Our reclaimed-look wooden merchandising accessories offer durable construction and stylish finish options to allow them to easily complement or contrast with existing decor for maximum visibility in heavy customer traffic areas.